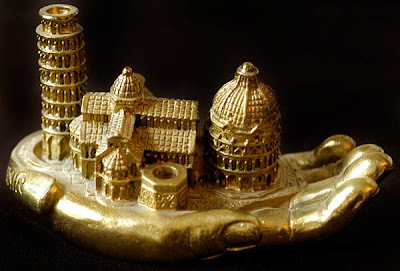 A collection of building from Pisa, Italy rests in the palm of a resin hand. A woman gets rather cozy with the Leaning Tower of Pisa. These are some of the more bizarre souvenir buildings I’ve seen. What do they mean? Who would buy them? Is that the golden hand of God delivering Pisa to the Italians? Do these odd creations only come from Italy? If you know of other bizarre souvenir building replicas, let me know in the ‘comments’ link below or send me photos of other unusual building replicas you’ve seen.